Ashburton Grove - Arsenal news and Arsenal opinion: Theo's a letdown -The Ox is a sponge -Sturridge to oust RVP? 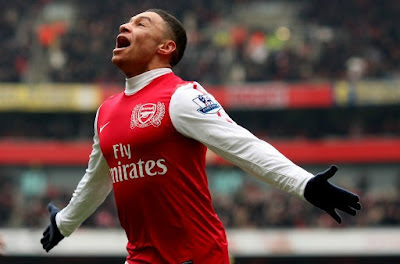 Theo's a letdown -The Ox is a sponge -Sturridge to oust RVP? We'll start with Theo Walcott who has been talking about the reasons behind our win against Blackburn. "The boss always takes a lot of stick from everyone criticising him, but us players need to look up to him because he's been taking it all. "We are the ones who go out there and put out the performances and sometimes they have not been good enough. "There are so many world-class players in the dressing room, so it is disappointing when we come back from Bolton with a 0-0 draw where we had a lot of chances." It amazes me how often footballers trot out the line about doing it for the boss. Surely they're trying to do their best every time they walk out on to the pitch? Personally, I think if every player gave 100% all the time, we'd be doing a lot better than we are now. The problem is that this season we've been far too inconsistent, especially on the road. Why haven't we been able to recreate the form we showed away from the Grove last season this time round? You never know which Arsenal team is going to turn up when you buy a ticket for an away game this season. The only constant on the road is the passionate away fans you'll be standing next to singing your heart out for the team you love. I guess the one thing we can all agree on is that one of the players whose form has been "not good enough" is Walcott himself. Had he finished that chance against Bolton we wouldn't have come away from there with a draw. Personally I think Walcott is playing for his Arsenal career. There is a certain ceiling Arsenal won't go above when it comes to his wage demands and I'm sure the club will walk away and cash in on Theo if they can't compromise. It's clear that he has talent but I'm sure he hasn't developed as much as Arsene Wenger would have liked in the last couple of years. Those contract negotiations are going to be interesting. One of the players Walcott will no doubt end up fighting for his place in the team with once Gervinho comes back from the Africa Cup of Nations is Alex Oxlade-Chamberlain and the youngster is keen to soak up as much information as he can. "I’m one of the least experienced players in the squad so any player who gives me a comment always helps me, whether it is positive or constructive criticism. "I listen to everybody. People like Thierry and Robin who score goals and are attacking players like myself, you can always learn a lot from them. That’s all I do, I listen and learn." It's great to hear he's so keen. We can see from his recent performances that he's going to be some player... imagine him and Jack Wilshere playing together in the same team. That would be awesom. Talking of Jack, he's been tweeting again! And you won't be surprised that he's made the pages of the Daily Mail website, not just for going on holiday with his son but also because he's using a machine to help heal his injury. If he plays again this season I will be pleasantly surprised. It's clear he can't wait to get back on the pitch and will do everything to achieve that aim. Couple of transfer stories. Carlos Vela wants to stay in Spain - now there's a surprise! I think Arsene Wenger would like him to stay there too, if he can get a decent fee for him. And we're on alert because Daniel Sturridge doesn't like playing on the right at Chelsea and could be looking for a move because he wants to play down the middle, according to the Daily Mail. I'm sure we'd be interested in him. He's a relatively young player. But he's not very patient. And where is he going to play for us? It's not like he's going to come into the team and replace Robin van Persie. Perhaps his people haven't noticed that we play only one central striker and he's a world class Dutchman. There is no chance that Sturridge can oust van Persie. And that's it. Wrap up warm today... like I said, it's freezing. Until tomorrow!